Taxis are a high-mileage, high-visibility segment that can serve as the on-ramp for technology transfer to the mass-market. Over the next three years, the program will deploy and operate four battery switch stations in the San Francisco to San Jose corridor that supports a fleet of zero-emission, switchable taxis. This fleet will offer many thousands of Bay Area residents and visitors their first EV experience. The program also has the potential to help California and the Bay Area meet their aggressive energy and climate policy goals when scaled to the entire region. Electric taxis are the gateway to clean cities. While gas-powered taxis are fewer in number than personal cars, these high-mileage vehicles are disproportionally responsible for harmful greenhouse gas (GHG) and other tailpipe emissions, so electrification of this fleet is essential to making a real impact on air quality and oil consumption. Since taxis drive nearly continuously, they require instant charge of their battery to maintain quality of service and continue serving the public. Given the taxi business, waiting three to four hours for standard charge is not an option. Battery switch is the only option that allows the driver to recharge in less time than it takes to refuel, the means of range extension for today’s gas-powered taxis. 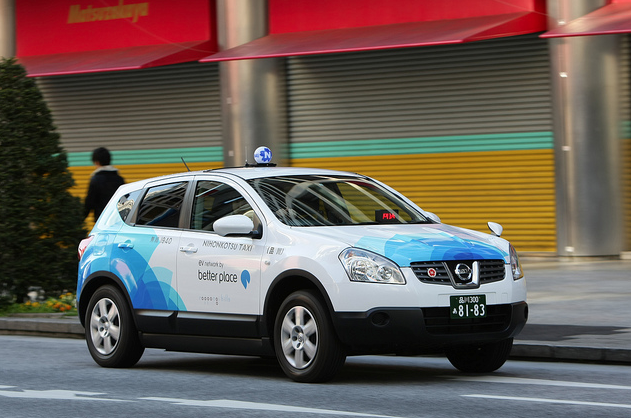 Better Place has been successfully operating an EV taxi program in Tokyo, supported by the Japanese government. The pilot project began on April 26, in cooperation with Nihon Kotsu Co., Tokyo’s largest taxi operator, and focuses on the feasibility of an automated battery switch process as means for taxis to have instant, zero-emission, range extension. In the first 90 days of the trial, the EV taxis drove over 25,000 miles using battery switch as the primary means of “instant charge” or range extension.